Anyone recognize this setup? Hand up if it's yours! I'm kinda really warming up to something like this. That looks like a conveyor which would be awesome if we didn't have to handle canola. Sure looks clean to me. I suppose you could put a drag on top of a bin on the end and make a straight row off it too to get some more capacity. Jake676 and Windmillfarms like this. Im confused that it appears the unloads are the inside of the circle? How do you get a super bee loaded in there? Looks like the fans are inside the circle and the unloads are outside. Yeah looks to be all the fan's are on the inside and unloads outside. X2 on the larger wet capacity. Where did you find the picture or video ? I agree on the wet storage, need a handful of those hoppers. And that wet bin might be way bigger than a person thinks, looks small beside the flats, but they might be 50,000 bu. 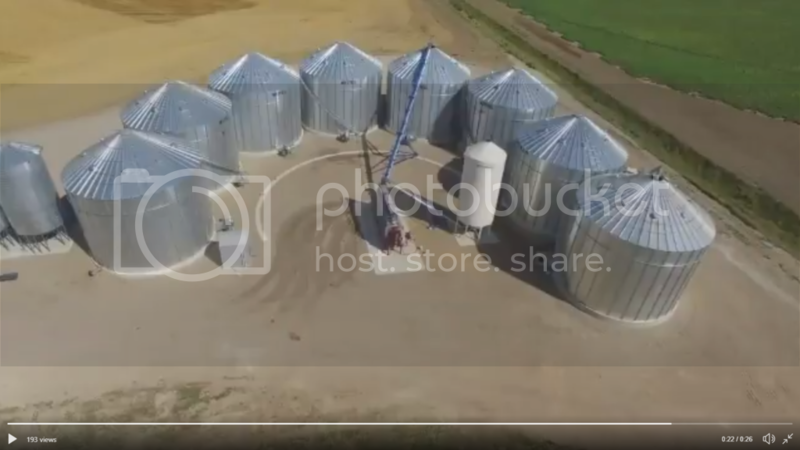 Whoever builds a bin setup in a semi-circle these days should be kicked in the nuts! Obviously no plan for anything beyond what is currently there/snow removal/truck orientation while unloading/etc. I am speaking from experience....never again. Straight rows only! crw, jdhrasko, chance2 and 2 others like this.